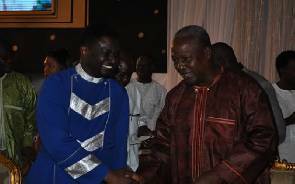 President John Mahama has predicted Bishop Dr Charles Agyinasare will become “a great Chancellor” as he takes over as the head of the Perez University College. The presiding Bishop of the Perez Chapel was sworn in as the Chancellor of the institution Saturday. Speaking at the function, Mahama encouraged educational institutions to change curricular to reflect what businesses and industries need for economic growth. The president urged a change from grammar-based curricular to a more practical, evidence-based one by universities to make them relevant to industries. President Mahama stated that “in 2014 the ministry of education, employment and labour relations and the ministry of trade organized a joint stakeholders’ consultation on jobs and employment. Participants from business and industry who attended this stakeholders’ consultation were very clear. 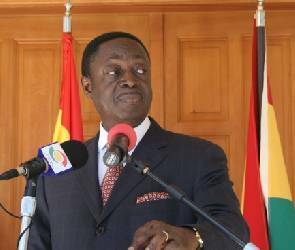 On his part, Bishop Dr. Agyinasare promised the institution will churn out problem-solving scholars. “I strongly believe that very soon this university college will churn out graduates who will not be learning by rote, but will be problem solving and solution providing scholars who will bring significant change and transformation to their spheres of influence. “Especially at this crucial time in the history of Africa where we are having endemic corruption and many visionless intellectuals and graduates from institutions who will rather stay at home than work if they have not been employed, where we have engineers who sit in the office and are not manufacturing, teachers who are still using books written in the 60s instead of writing new material. Where most of our people do not want to think outside the box to accomplish unprecedented feats. I am convinced that there must be a change and I am glad to announce to you that change is coming,” the Presiding Bishop of the Perez Chapel International, which owns the university told the gathering. The Perez Chapel International acquired the Pan African Christian University College in November 2015. The institution and its two schools are duly accredited by the National Accreditation Board of Ghana since 2007. The School of Theology has affiliation with the Trinity Theological Seminary (TTS) and the School of Business is affiliated to the University of Cape Coast. These mentor institutions have the responsibility for overseeing the courses, training and certification of the respective schools. To ensure a commitment to academic excellence, Perez Chapel has put together a Board of Governors made up of distinguished and accomplished individuals to oversee the running of the University. Board of directors Members of the Board are: Dr Charles Agyinasare, Dr Mensa Otabil, Professor Omane-Antwi, Professor Asamoah Gyadu, Professor Addo Obeng, Dr Kotei Dzani, Mr. Francis Ashinyo, Honourable Sylvester Mensah, Dr Mrs Vivian Amoako, Dr Emmanuel Saboro, Professor Amoa Awua, Bishop Dr Prince Baah and Lawyer Mrs Grace Dolphy. The University is now located at Gomoa Pomadze-Winneba, along the Winneba-Swedru highway, about a kilometer from Winneba roundabout (Junction). Despite its close proximity to Winneba of the Effutu Municipality, it administratively falls under the Gomoa East District Assembly. The plan is to add on other campuses in the coming years.